Anyone who likes warm, earth tone colors and rustic, Old World Mediterranean style furnishings will love Tuscan style interior design. This decorating style is very similar to Southwestern style architecture and décor commonly seen in areas such as Southern California, Nevada, Arizona, New Mexico and parts of Texas. Although the Tuscan countryside is located in Italy, influences from the French and Spanish countryside, which border the Mediterranean Sea just west of Italy, can also be found in Tuscan style design. Influences from the ancient Etruscan culture and the Renaissance period of the Middle Ages are present as well. Other natural influences found in the Mediterranean countryside include cypress and olive trees, grapes grown in the many wine vineyards, golden, luscious pears and the beautiful scents and colors of flowering plants such as jasmine, rosemary and bougainvillea. A Tuscan color scheme will be very warm and natural, just like the Mediterranean climate of the Tuscan countryside. Begin with earth-tone, neutral shades such as the brownish-orange of terra-cotta clay and the light, creamy shade of worn plaster walls. Shades of green represent the tall, magnificent cypress trees that line Tuscan country roads, the vines of grapes and the foliage and fruit of olive trees. Rich ocher and deep, golden yellow capture the colors of a Tuscan sunflower field, the ripe fruit of a lemon tree and the warm rays of the setting Tuscan sun. Cobalt blue reflects the colors of sea and sky while deep burgundy brings to mind a fine wine. If your home doesn't already have some of the following architectural features, you can add these elements to begin a Tuscan themed renovation. 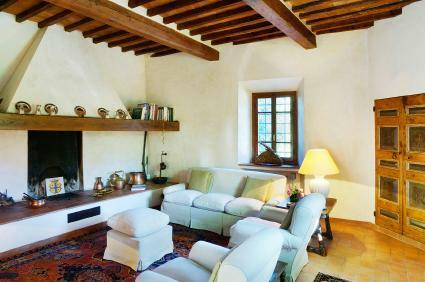 Choose a Tuscan color palette for the walls in your home. 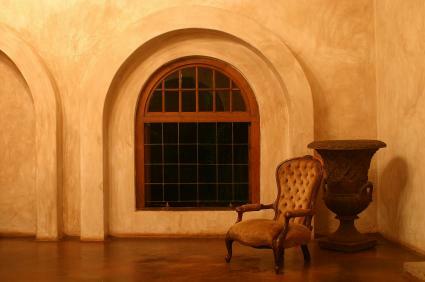 Popular wall treatments that mimic the stucco and aged plaster walls seen in authentic Tuscan architecture include glazing, color washing, lime washing, and hand troweled textures. Classically designed plaster moldings add definition and sophistication. These features can be accented with gold leaf or finished very simply. Giving your home a Tuscan inspired look begins with architectural elements such as terra-cotta floor tiles and roof tiles. Natural stone such as Travertine, marble, granite and limestone are used as building materials for floors and countertops. Tile mosaics are common for kitchen backsplashes and courtyard fountains, where you may find hand painted tiles like the ones created by artist and designer, Linda Paul. Ceilings can become part of your Tuscan design with the addition of medallions above light fixtures or just to dress up a plain ceiling area. Dark wooden beams are standard features of a traditional Tuscan ceiling, creating a rustic contrast with the smooth, light-color plaster walls. Painted designs such as clouds or angels are frequently used to decorate ceilings in foyers and dining rooms. 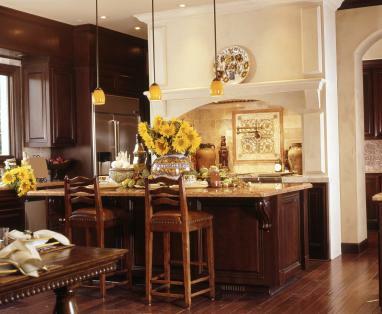 Dial in your Tuscan design with the right furnishings, accents and accessories. Stained wood cabinets will blend perfectly with rustic Tuscan kitchen décor such as a wrought iron hanging pot rack with copper pots and pans, small terra-cotta pots filled with herbs such as basil, rosemary and oregano or a couple of large terra-cotta planters filled with a lemon tree and a bougainvillea. Colorful, ceramic bottles filled with olive oil, countertop wine racks, woven strands of garlic and baskets filled with fresh vegetables add the right culinary accents. Appliances in a new Tuscan-style kitchen may include sleek, stainless steel finished units, copper range hoods or even appliance covers with Tuscan art themes. If your kitchen has limited natural lighting, you can mimic the bright, Mediterranean sunshine with extra lighting options such as under counter lighting, recessed ceiling lights, skylights or hanging pendant lights. Throughout the home, framed wall art featuring the Tuscan countryside or still life featuring flowers, grapes, wine bottles and cheese can be added to the walls. 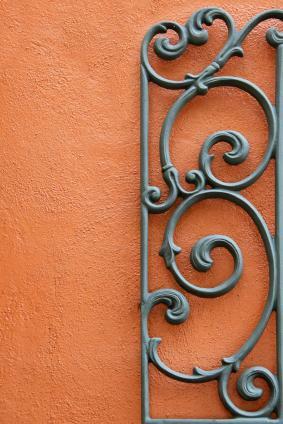 Wrought iron wall accents such as mirrors, sconces, candle holders, shelves and iron gates help achieve the Tuscan look. Woven wall tapestries add interesting textures. Classic, Mediterranean style furniture will have a lot of scrolling ironwork and richly stained wood with highly polished finishes. Intricate hand-painted designs are also common featuring leafy grapevines, flowers, fruits and elaborate scrolls. Hammered copper, wrought iron doors and uniquely crafted latches, hinges and drawer pulls add stunning accents to rustic wood furniture. Wrought iron bed frames and floral quilts continue the look into the bedroom. Add rustic wooden nightstands and a wooden bench at the foot of the bed. For window treatments, use a dark wooden or wrought iron curtain rod with long, flowing drapes. Tuscan style interior design brings Old World romance and elegant home furnishings together in a warm and inviting design scheme that is just as appealing now as it was in the past. Browse through some Tuscan design photo galleries for more ideas on how to create this charming Mediterranean atmosphere in your home.